Walk into any warehousing facility, plant or manufacturing plant and you will find two things; a forklifts and an indoor air quality concern . Gas forklifts, often fueled by liquid propane gas (LPG) or gasoline, emit toxic exhaust emissions, smoke, fumes and odors. These emissions become quite serious when forklifts are operated in confined or porrly ventilated areas. Is it bad for the forklift operators, as well as other workers, who are inhaling the fumes? Need proof, check your health and attendance records. Natural gas is the cleanest fuel available today, reducing emissions, such as carbon monoxide, by up to 95% over propane forklifts, as evidenced in the Environmental Protection Agency’s data comparisons in the chart below, which is still current as of 2010. This means no more headaches for your workers, and no smell of propane. With cleaner burning natural gas, forklift operators and fellow workers are exposed to considerably less emissions. Cleaner indoor air also means less air changes and lower heating bills for those of you located in the colder climates. And because of the simple chemical makeup of natural gas, your engine stays clean and tuned. Since natural gas is stored in permanently mounted tanks on your forklifts, there is no lifting of heavy propane bottles, eliminating potential back injuries. The conversion from LP to Natural Gas is surprisingly easy and can be accomplished in a few hours. A new tank designed to hold compressed natural gas at 3,600 psig replaces the old LP tank along with fuel system components that deliver natural gas to the forklift engine. 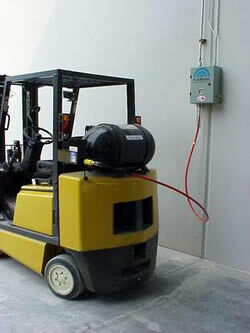 Refueling CNG powered forklifts can be accomplished by either fast fill or time filling. Fast fill station designs allow forklifts to fuel in the matter of minutes, without changing out heavy propane tanks. Operators simply connect the forklift to a re-fueling post and transfer clean natural gas into the high pressure tank. In time fill applications, forklifts connect to fill post assemblies and remain parked over an 8 hour period. Gas is then transferred to all the forklifts within this time period. When operators return, all the forklifts are refueled and ready to go.Operators can monitor how much CNG they have on-board their forklift and can easily replace the fuel without the worry of running out of propane tanks. There has been much recent focus on the "going green" movement across the United States and no, this doesn't leave out forklifts. Green forklifts have managed to cut down on the loud noise, are emissions free, and are holding up in strength. Well said, hopefully it will be a good solution.